Concussions and post-concussion symptoms are becoming more and more common. There are no medical tests that can confirm if a person has had a concussion and the symptoms of 80% of all concussions are gone after 1 week. Concussions occur when an external mechanical force causes brain dysfunction and usually result from a violent blow or jolt to the head or body. The best treatment immediately after any concussion is the same as any other injury: REST. Rest has two very important features when it comes to concussion. First, it prevents the brain from being injured any further and secondly, rest allows optimal allocation of resources to all maximal recovery to occur. COMPLETE PHYSICAL and COGNITIVE REST is prescribed during the initial recovery period. This means: no school, no homework, no texting, no computer/video games, no television, no physical activity until the symptoms of concussion begin to subside. As the symptoms improve a slow introduction of demand may be started. As you improve a slow and graded rehabilitation can begin. At Physioactive we recommend that sensory and cognitive activities are begun first and then a gradual increase in physical activity, with each stage separated by a period of at least 24 hours. 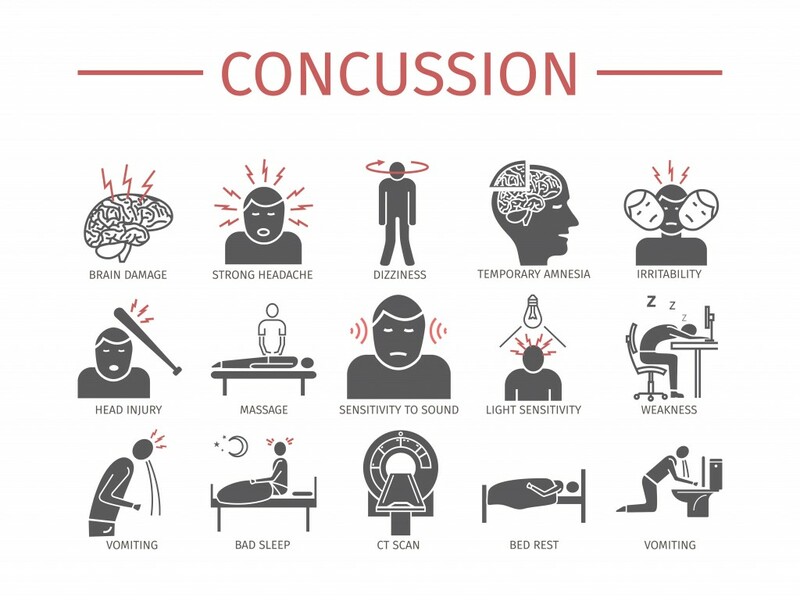 This process must be monitored by a clinician with extensive training in concussion injuries, as there are numerous signs which could delay recovery if not properly addressed. In an ideal world, the patient should have NO SYMPTOMS as these demands are increased. If symptoms are encountered, this is an indication the demands on the brain are too much and should be reduced. The patient should drop back to the previous stage for a 24-hour period before attempting the next stage again. The final stages involve monitored increases in ones physical exertion and to assess blood flow within the brain, as well as extensive testing of neurological, mental and physical systems, to ensure that your brain has recovered and you are safe to return to activity without causing further damage. Most patients will make a quick and full recovery. Post-concussion syndrome is a clinical term when concussion symptoms that last longer than a week. If the symptoms persist or do not begin to improve, or in some cases, new symptoms can begin, rehabilitation becomes an absolute necessity. All concussions are brain injuries. The term mTBI has been used to distinguish between concussions (aka mTBI) and TBI which encompass more severe brain injuries, resulting in paralysis, coma, loss of cognition, memory or other mental and physical functions. Many brain injuries, especially when the person does not lose consciousness, go unnoticed and are never reported… and therefore never treated. Any injury to the brain is serious so we don’t love this definition or terminology at Physioactive. Why Choose Physioactive for treatment of your concussion. Specially trained and complete team of healthcare providers who can accurately assess and properly guide you in your recovery. Emotional, primarily through support and small attainable functional goal successes. In therapy, Physioactive addresses all components of a whiplash and post-concussion disorder. The key is specifically graded exercises addressing the categories listed above. Therapy and exercises may include neck exercises addressing the range of motion, strength, control, myofascial trigger points, and joint position or proprioception. More importantly, neural integration of neck and arm movements with breath and autonomic system regulation must be accomplished in order to heal. Other therapies may be included in your rehabilitation program. These include ocular exercises, balance, and vestibular exercises. Aerobic and autonomic regulatory exercises are important in treatment gradually increasing the aerobic demand and endurance. Graded increases in cognitive and sensory stimuli are incorporated based on current tolerances. The ocular exercises are incorporated as an effective way of stimulating specific areas of the brainstem and brain and central integrating system. Vision and eye movements are complex tasks that integrate multiple areas of our brain. Without constant monitoring of the autonomic nervous system brain and neurological repair is not possible. The key to successful improvement is a slow progression paying close attention not overwork the central and peripheral systems. This will be achieved with close monitoring of the exercise program. If overworked, neural symptoms may worsen and regression may occur. We have had great success even with the most chronic post-concussive and vestibular patients. Ones’ neural system is plastic and has the capacity to improve even years post-injury. How can Osteopathy or Craniosacral help your recovery? Cranial therapy or craniosacral therapy is usually included in most post concussive treatment programs at Physioactive. Injury to the bones of the skull, the thick fascia protecting the brain (dura, arachnoid, and pia) all can become injury at the same time as the brain in a concussion. This is an often overlooked area in most other concussion rehabilitation programs. It will be an important treatment modality needed to restore proper cranial movement, dural mobility, and assists in regulating the autonomic nervous system. Some examples of nervous system tests may include balance tests such as the Rhomberg. Other observational tests are included looking at how you walk, stand, turn in a variety of position. Your breath, blood pressure, heart rate and posture all play an important role in the rehabilitation program. Coordination tests and neural mapping tests may be performed. Ocular or eye tests including gaze fixation, vision tests, saccades, pursuits, convergence, and optokinetics are tested. Frequently these simple eye tests can provoke concussive symptoms. By putting together a myriad of tests your therapist is able to pinpoint as accurately as possible which systems are working suboptimally and design a program to first balance the neurological system and then strengthen it. The spine, its movements, and its attachments are evaluated and treated as necessary. In order to treat all concussions, the patient must have all dysfunctions in the cervical, thoracic and cranium optimized, restoration of dynamic stability and proper breathing are also essential.